Tricia Nixon opened the first self-driving car network on Oct 24, 1972. She said it was “more fun than Disneyland.” The Federal highway monopoly has blocked further deployments of PRT in America since. That same highway policy caused the bankruptcy/abandonment of nearly half the freight railroads depite 400+ ton-miles per gallon efficiencies. West Virginia University Transportation site. 110 million injury-free passenger-miles. In the same period, 1.7 million Americans were road-killed. Pays for itself every 5 year, independent audit in 2010. Congressional Office of Technology Assessment study (COTA 1974) PB-244854, a solution for American cities to be independent of foreign oil. Link to one-minute video of Morgantown's PRT. Link to 17 minute, 1977 video of the benefits experienced since PRT opened in 1975. Morgantown PRT opened in 1975 and has delivered 110 million injury-free passenger miles. By all accounts the Morgantown PRT has been an absolute success. 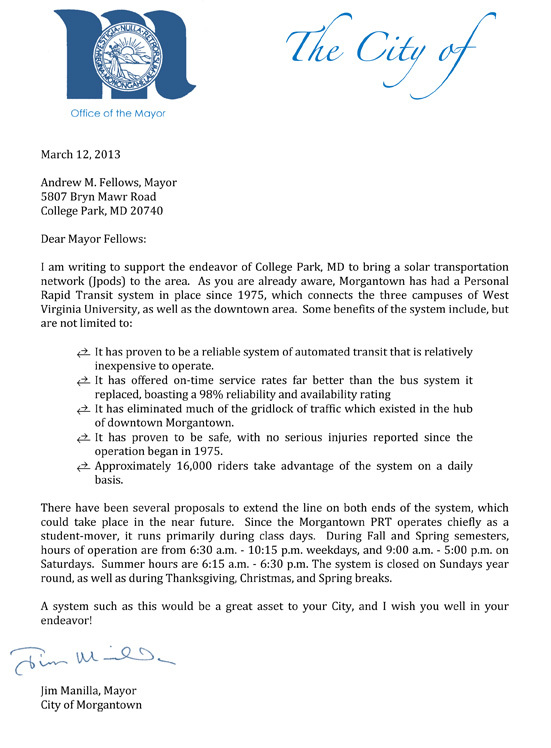 Link to a 1977 video of that success two years after the PRT opened.. Below is a letter from the Mayor or Morgantown explaining the benefits PRT has provided to his city. 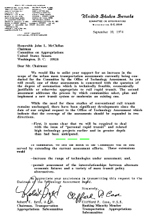 In response to the 1973 Oil Embargo, the US Senate asked DOT for mobility solutions to prevent hardships in future embargoes. 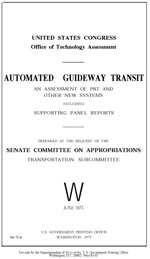 The Office of Technology Assessment provided an answer to the Senate Committee on Appropriations in Automated Guide Ways and Personal Rapid Transit (PB-244854). An independent audit in 2010 indicates the network pays for itself every 5 years. The Office of Technology Assessment study resulted in the conclusion that "PRT has the highest potential service level and may have the highest patronage level of all AGT [Automated Guide way Transit] systems." Federally sponsored R & D has not included a coordinated program for conversion of successful products into operational systems. UMTA's R&D programs [US DOT Urban Mass Transit Administration]... have neglected near-term ... simpler approaches to correct transit problems. Finally, institutional failures may have hindered implementation. Germany built a similar system with Cabinetaxi (updated system at Dortmund, Germany). More recently, other companies have been developing their own PRT systems which will solve various transportation challenges. ULTraPRT at Heathrow Airport and Masdar City are two of the more developed Systems. JPods networks can be built for a fraction of the cost of Morgantown's PRT, going beyond PRT to a whole new level of on-demand personal mobility networks. To support the deployment of such networks, JPods has created a set of software programs that allow anyone to model solar-powered mobility networks for their community. Click to get the software.